Colorful character whose time in rock coincided with the birth of genre itself and who helped introduce much of its exuberance and off-color appeal in those early days. Charles Waterford was born in Arkansas but got his start singing professionally while still in his mid-teens in the Midwest for a band originating from Kansas City, Leslie Sheffield Rhythmaires, a territory band with whom he appeared for awhile in Oklahoma alongside soon-to-be revered jazz guitarist Charlie Christian. He moved to Chicago joining the acclaimed Andy Kirk and his 12 Clouds Of Joy but World War Two intervened before landing with noted pianist Jay McShann, with whom he made his recording debut in 1945. Though these were jazz sides, leaning towards blues, Waterford’s style was already a bit too restless for those confines and he was replaced by Jimmy Witherspoon who was far more suited for that milieu. Over the next year and a half he recorded a handful of sides for the small Hy-Tone label and then the larger independent Aladdin, already specializing in lewd sexual themes delivered with a joyous fervor. But it was ironically with major label Capitol Records at the dawn of rock where he cut his most acclaimed (and notorious) sides. Failing to make a commercial dent he moved to King Records in 1949 which should’ve provided him with the ideal platform for his work, the strongest of the independent labels with solid musicians and producers who knew how to market rock as evidenced by their roll call of hits to date. But whether lost amidst the more established names in the same vein already recording for the label, such as Wynonie Harris, or because his skills were rather limited, unable to handle diverse material convincingly and reliant on the same melodic framework for the songs most suited for his delivery, he failed to connect here as well. 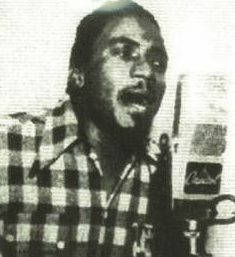 Over the next decade and a half he was a journeyman singer, performing where and when he could with diminishing acclaim, recording only sporadically for ever smaller labels, Waterford eventually gave up secular music and moved into gospel when he became a minister in Florida in the mid-1960’s. Late in life his rock material received some belated attention and he made a well-received, albeit minor comeback, recording a final album at the age of 85. Waterford passed away in 2007 at the age of 90 having recorded music in styles ranging from the pre-war jazz and blues idioms to gospel, but he found his most lasting legacy in rock ‘n’ roll.